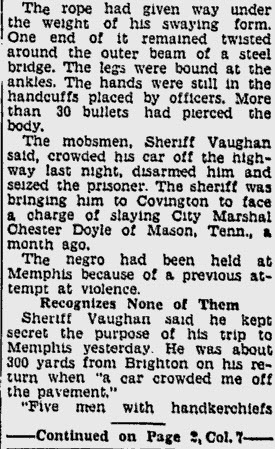 I’ve been brainstorming ways that I could further my research on the Black community in the West Tennessee area. I’ve decided that with the amount of time I spend there that I should begin doing genealogy look ups. If you have information that you need assistance with that can only be found by actually visiting the West TN area, please let me know and I will be happy to assist. Please leave your details in the comments section. I hope everyone has been enjoying their Black History Month so far. I hesitated before posting this particular clipping, but decided to anyway since it can be found in Jet Magazine. I couldn’t help but to giggle at the fact that Jet Magazine used to publish gossip. I have an idea who this is about, but I really wonder if they ever discovered that their gossip made it into Jet Magazine. 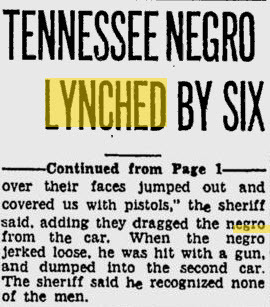 Below is a list of Blacks lynched in the Lauderdale County, TN area. This is by no means a conclusive list. The true number of Blacks lynched during the post slavery era will never be known. I wonder if these individuals were guilty at all of the crimes that caused them to be sentenced to death. Some may have been, but some may have been innocent.